Are you searching for the perfect gift? Search no more. 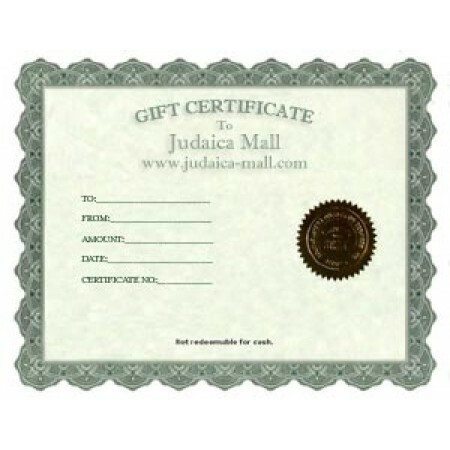 Introducing Judaicash - online gift certificates available now. Whatever their preference, you’ve got them covered with a Judaicash Gift Certificate delivered via email in printable format. Eliminate unwanted gifts this holiday season. Convenient Ordering - Deliverable in 12 Hours or Less. May include your personal message. The remaining balance, if any, is available on subsequent visits. Can be exchanged for more than 3500+ great products. Buy now and we will give you an additional 10% FREE !